The Buniga Forest Walk is now open! Located in Nkuringo near Bwindi Impenetrable National Park in Uganda, this 1.5 km trail explores Buniga Forest, with its lush tree ferns and giant lobelia. The Walk is guided by the local Batwa – an indigenous group of people who formerly lived nomadic lives in the forests of the Great Lakes region of Africa. While on the walk, tourists benefit from the Batwa extensive forest knowledge and survival skills, passed from one generation to the next. These skills include harvesting honey and trapping wild animals for food. 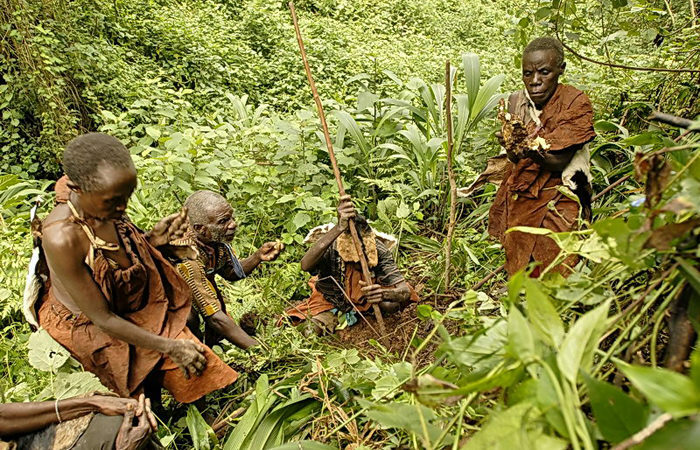 More than the opportunity to learn from the Batwa guides’ forest knowledge and survival skills is the opportunity to experience real Batwa culture as well – song and dance, burial and mourning, jubilation at a successful hunt. As well as several forest dwellings that are impressive, fun and functional. The unique element of the Buniga Forest Walk is that you meet your Batwa guides in the forest as they lived in times past. But after completing the 1.5 km trail, you have the opportunity to meet your guides as they live today, in their settlement now outside of the forest. At the settlement, guests are welcomed with open arms and a wide range of Batwa handicrafts are for sale by members of the community. Take an exciting stroll on the Buniga Forest Walk and meet the Batwa then and now! The Buniga Forest Walk can be booked from the Nkuringo Community Conservation and Development Foundation office in Nkuringo and costs 25 USD per person, regardless of nationality or residency. Fees for the Buniga Forest Walk are allocated at 30% to Kisoro Local Government, and 70% to NCCDF, who pays the community and Batwa guides and reinvests the remaining funds in community conservation and development projects in the local area. Tourists should allow approximately three to four hours for this activity and the Buniga Forest Walk is classified from an easy to moderate hike on a new and well-developed trail.